(a) Check the resistance between the terminals when each switch is operated. If the result is not as specified, replace the switch. 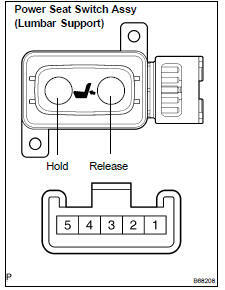 (a) Check the resistance between the terminals when the switch is operated. 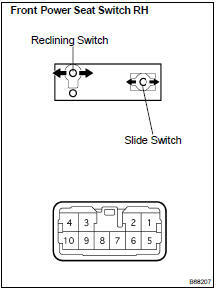 If the result is not as specified, replace the switch assy. (a) Check operation of the slide motor. 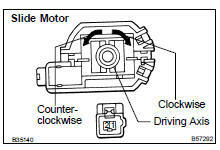 Check if the motor rotates smoothly when the battery is connected to the slide motor connector terminals. (b) Driver's seat only: Check operation of the front vertical motor. Check if the motor rotates smoothly when the battery is connected to the front vertical motor connector terminals. If the result is not as specified, replace the front vertical motor. 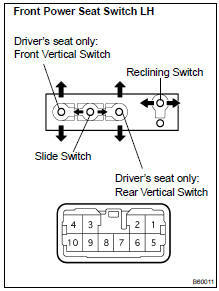 (c) Driver's seat only: Check operation of the rear vertical motor. Check if the motor rotates smoothly when the battery is connected to the rear vertical motor connector terminals. If the result is not as specified, replace the rear vertical motor. d) Check operation of the reclining motor. Check if the motor rotates smoothly when the battery is connected to the reclining motor connector terminals. If the result is not as specified, replace the reclining motor. (a) Check operation of the lumbar support adjuster motor. Check if the motor rotates smoothly when the battery is connected to the lumbar support adjuster motor connector terminals.